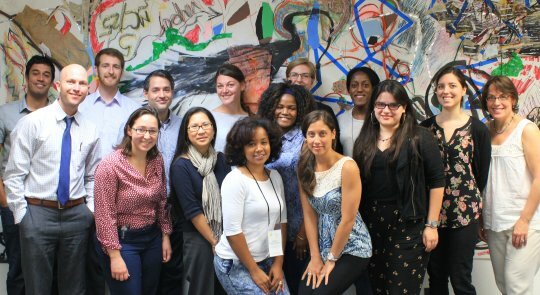 I have been following the Emerging Leadership Institute (ELI) since I started working at Young Audiences Arts for Learning (YA) two years ago. It is an exciting program that promotes leadership in the field of arts in education through a year-long professional development institute for YA emerging leaders. Now in its 4th year, ELI was piloted in 2011 in New Orleans, Louisiana and has been generously supported by American Express. 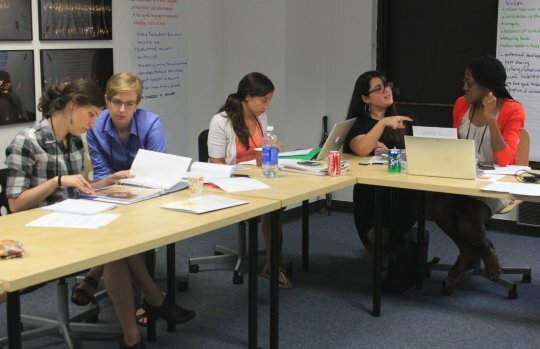 We began this year-long institute with a three-day conference in Chicago at the offices of our affiliate, Chicago Arts Partnerships in Education (CAPE) on August 4-7. We would like to thank them for lending their work space and for their presentations on research, strategic planning and program evaluation. I am not going to dive into the details of each agenda item; it would be too much content to cover for this blog feature. I was thrilled to take part in this professional development opportunity along with thirteen colleagues from the YA network. I was expecting a conference which focused solely on managerial best practices and creating strong connections with colleagues from the YA network. But the agenda went way beyond my initial expectations by including rigorous and interactive sessions, thanks to Lori Roth, founder of the Strategic Learning Associates, who led in the design of the content for the challenging and thought-provoking institute. One of the main concepts that we explored was the difference between the leadership and management skillsets. Promoting innovation, aligning people and creating vision are a few of the activities associated with leadership, while management skills are more likely to focus on sustainability, problem solving and the creation of policies and plans. Both are needed to be successful, but most of us tend to have more innate abilities associated with one than the other. I worked with several ELI participants to discuss my strengths and weaknesses and we will continue to monitor our progress and become more self-aware throughout the year. A special focus was also given to peer-to-peer sessions and break-out groups, where we discussed our role at YA, inquired about each other’s successes and missteps and received feedback. Already, ELI participants have become fully engaged by emailing each other links to related readings and TED Talks and continuing the discourse from Chicago. This is only the beginning as ELI will continue throughout the year with two more in person meetings and multiple webinar presentations. One new element to this year’s program is the start of a mentorship between the participant and his or her supervisor which will provide ongoing insight, greater growth and development. This blog feature was contributed by Marcus Romero, Communications Manager, Young Audiences Arts for Learning.